To most of us, the definition of recycling is to use again in the original form or with minimal alteration. The Cambridge English dictionary defines it as “to sort and collect rubbish in order to treat it and produce useful materials that can be used again for a different purpose”. In the Transformation Oracle Deck, this card is about total self-acceptance. Learning to love every little inch of our lives, even the nasty bits. If you do not accept all of these pieces of yourself, “emotional entropy” or degeneration begins to happen. Old emotional pain is transformed into new energy. © 2016 Cheryl Mlcoch. Throughout our lives, we experience the light and darkness of this world. Whether it be joy, love, trauma, grief, self-doubt, or revenge ~ these contrasting emotions are all part of the journey we call life. For many, the dark experiences can create a trap in our minds that can feel like a prison. 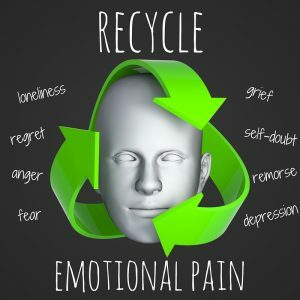 In order for us to truly enjoy our human experience and for any of it to really make sense, it is essential that we learn to recycle our emotional pain as often as possible before it builds up and begins to grow like a cancer inside of us. If we get stuck not being able to move through it, we may try numerous unhealthy approaches to make it go away such as, avoidance, numbing, dissociation, pretend it doesn’t exist, and/or emotionally fight it day after day. Emotional pain is like a manipulative bully and will follow you wherever you go. When we keep our pain a secret – that is what puts us at risk for getting mentally and physically ill. The Recycle card helps us accept and transform old pain into something useful. Jeanne Weierheiser from MindBodyGreen said, “Pain is an invitation to deal with the unfinished business of our past.” This is now an open invitation to self-compassion as well as understanding the source of your emotional pain! It is time to visit with the inner wounded child/teen and/or adult who needs your love and attention right now! This type of self-love is one of the best gifts you can give yourself to help establish connection with the fragmented parts of yourself. If you do not accept all of these pieces of yourself, “emotional entropy” or degeneration begins to happen. When I look at the Recycle card, I see a beautiful tapestry of messages. Each and every patch on the quilt represents a particular story in your life whether it be a loving memory or one so dark that you may or may not know where to put it on the quilt. It also displays the elements: Earth, Water, Air and Fire. Each has a purpose in the recycling process. There is even a symbol of a SPIRAL which reminds us that more people can be effected than we can imagine. Seeing the woman relaxing on the grass reminds us of the peace we can feel on this planet when we have salvaged the patches of good from the trash. Begin weaving in the joyful and loving moments of your life using whatever colors you feel it represents. You will have patches that show challenges you were able to overcome. When you come upon a memory that is too dark to weave into your quilt, the elements can now help guide you in this process. Visualize surrendering the memory to the WATER element to help transform the experience into something only for your highest good. Visualize casting your memories into the FIRE that you know are too dark to keep. The FIRE can represent God, the Divine or the Universe. These moments serve no purpose staying with you and you have the power to release them so you may move forward in your healing. Whatever painful events happened to you do not define who you are, but your story matters! This powerful patchwork quilt represents YOUR story and the sewing will continue until your time on this EARTH is finished. In the end, you can allow this quilt to represent your stories of triumph, joy, pain, and sorrow. The recycling of your pain will ultimately turn your wounds into wisdom! 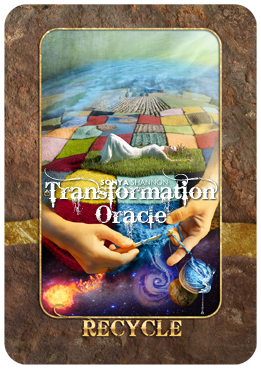 The Transformation Oracle is full of guidance for life’s problems. Except for the pencil drawing at the top, this article was illustrated with details from the 44 cards in the Transformation Oracle deck. 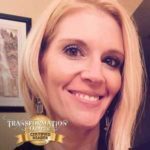 The Fire Element in Separation and Divorce by Transformation Oracle Certified Reader Michelle W.
Liberation from Controllers by Transformation Oracle Certified Reader Sandy Schneider. How to Let Go Of Love…And Move On by author/artist Sonya Shannon.